Perhaps you are more familiar with Niagara as the biggest and highest waterfall in the world. 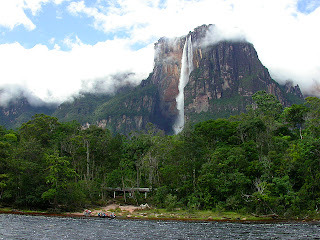 But that was before, because now there is Angel Falls which has a height of 979 meters (3212 feet). Angel Falls or Salto Angel is a waterfall that falls freely without hindrance around 807 meters (2647 feet). 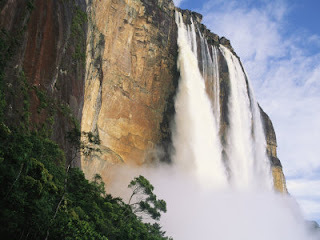 More precisely waterfall is located on the Rio Caroni, Canaima National Park, Venezuela. This is a famous tourist spot in Venezuela. Angel Falls drops into the Carrao river with varying amounts of water depending on the season and rainfall accumulating on the top of the tepui. The steep cliff of the tepui is constantly eroding due to the effect of water on sandstone. Angel Falls was first seen by the explorer Ernesto de Santa Cruz at the beginning of the 20th century before the known world. Then the American aviator, James Crawford Angel was officially discovered this waterfall as he searched for gold mining site. In 1936, James Angel returned and landed near the waterfall. To commemorate the founder of this waterfall named "Angel Falls". However Pemon Indians themselves called it a "Auyan-tepui" ("Aiyan-tepui") or "Mountain of the Devil". This waterfall supposedly also be entered as 7 wonders of the world to come than the island of Komodo in Indonesia, U.S. Amazon Forest, Bay of Fundy Canada, Bu Tinah Island United Arab Emirates and the Cliffs of Moher in Ireland. The trip towards the angel falls itself has many attractions. The boat rides and walks through the jungle offer a unique view of Venezuelan flora, fauna, and terrain. If the water flow is mild enough, you can swim in the small pool that forms below the falls.